A controversial pastor who claimed he could give infertile couples "miracle babies" is a step closer to extradition on child abduction charges. Two High Court judges have refused to give Gilbert Deya permission to appeal to the House of Lords against the order to extradite him to Kenya. Mr Deya, the self-proclaimed bishop of a church in Peckham, South London, says he faces torture in his native Kenya. The Kenyan government alleges he stole five children between 1999 and 2004. Deya's lawyers argued his case should be certified as one raising issues of general public importance that should be considered by the Law Lords, but this was rejected by Lord Justice Dyson. Mr Deya has no more avenues of appeal in the UK and his lawyers are considering a last-ditch application to the European Court of Human Rights. 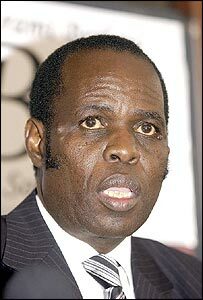 Mr Deya, 55, runs Gilbert Deya Ministries, which claims a UK membership of 36,000. The five children that he is accused of stealing have all been taken into care in Kenya. Police in Nairobi say their investigation revolves around the disappearance of babies from Nairobi's Pumwani Maternity Hospital and involves suspects in Britain, Ghana, Nigeria, Uganda and Kenya. In fighting extradition, Mr Deya has argued that he is the victim of a political vendetta in Kenya and said his human rights would be compromised by the poor conditions in a Kenyan prison. The High Court rejected his fears of ill treatment and accepted the Kenyan government's assurance that the country's new coalition government was committed to improving jail conditions. It refused to certify the case was fit for the House of Lords. Lord Justice Dyson said the court found it "very difficult to believe Mr Deya would be incarcerated in any prison conditions" which were in breach of Article 3 of the European Convention on Human Rights as his lawyers had argued. A district judge ordered Mr Deya deported last year, a ruling which was later confirmed by Home Secretary Jacqui Smith.